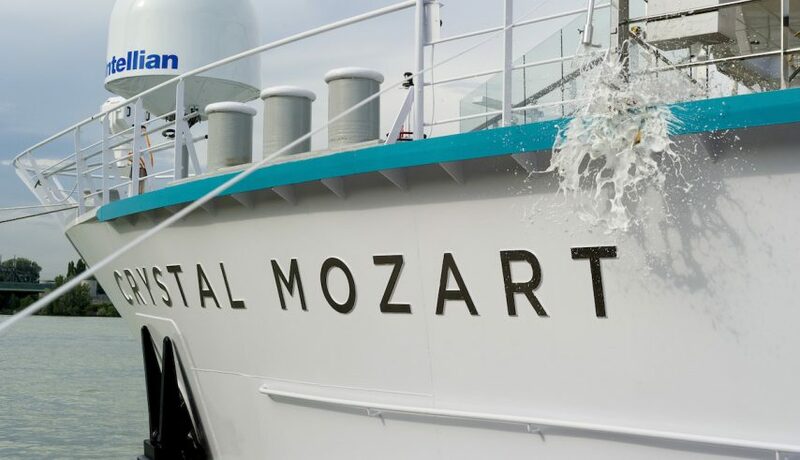 Today, in the latest milestone for the expansion of Crystal Cruises, Crystal Mozart was officially welcomed to the Crystal River Cruises fleet in Vienna, Austria, during an elegant ceremony attended by local dignitaries, media, and Crystal executives. The “Queen of Europe’s Rivers” was christened by godmother Ms. Elisabeth Gürtler, the managing director of both the Hotel Sacher, Vienna’s most famous hotel, and the city’s historic Spanish Riding School. Crystal Mozart’s maiden voyage on July 13 will mark the official launch of Crystal River Cruises, which will see four additional river yachts launched by the end of next summer. The ceremony featured a traditional Viennese Brass Orchestra dressed in historic uniforms and playing traditional Austrian Marches. Master of Ceremonies and Crystal Mozart’s lead entertainer, musician Mark Farris, then ushered guests shoreside for the naming of the ship by the godmother and breaking of the magnum of Szigeti’s 2011 Sonderedition “Adele” champagne. Further festivities included a lavish dinner in the ship’s Waterside and Blue restaurants followed by transportation to the Belvedere Palace for an exclusive evening of Mozart and Strauss performances, an event that all Crystal Mozart guests will experience complimentary when sailing on Crystal River Cruises’ Danube river itineraries. Each suite aboard this technologically advanced ship offers Apple iPad devices that serve as Digital Directories for virtually all onboard needs as well as 40-inch flat-screen HD televisions. Throughout the ship, digital signage puts available services and port information at guests’ fingertips, including weather forecasts, spa appointments, dining reservations, and profiles of Crystal crewmembers. Measuring 395 feet long and 75 feet wide, the all-suite, 154-guest Crystal Mozart will sail itineraries along the Danube River, calling in locales throughout Austria, Germany, Hungary, Slovakia, Croatia, and Serbia. Most excursions are complimentary, guests can reserve electronic bicycles on the ship for independent exploration, and VIP Champagne boat tours will also be available for private cruising and sightseeing along Europe’s narrower waterways. Rise and Shine – Some cruisers might think getting up before dawn is crazy. They don’t know what they’re missing.